Thanks to Dlisted (your choice destination for weird cat news as well as Amy Winehouse updates), I learned about Sgt. Podge, a British cat with a striking resemblance to our own Frowst. It turns out Sgt. Podge, like Frowsty, has a marked sense of entitlement. He wanders off each night and is picked up by his owner at the same spot -- a mile and a half from home -- every morning, whereupon he climbs into the family's luxury car with elan. Glamorous fluffy cats. Those bastards will take over the earth. 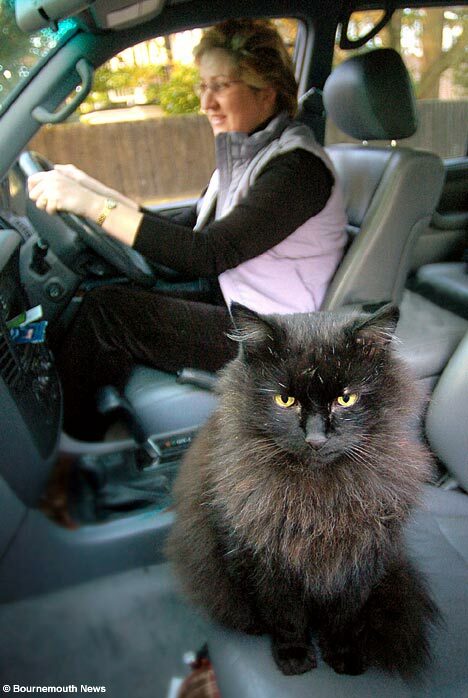 I was thinking "hehe, spoiled kitty" right up until the last line: Mrs Bullard, who has another son Daniel, 16, plus four other cats and two dogs, said Podge's taxi is normally her 4x4 but she sometimes uses her Maserati sports car. Oddly, that seems to make it all make a little more sense. i avidly read dlisted yet rarely for cat news. amy winehouse's beehive does look a little like a cat fight though. Hmmm... Beautiful cat, but Frowsty definitely has the Sarge beat on the hypnotic gaze. No doubt the Doppelgaenger sacrificed his immortality for the posh life. Perhaps like the twins from "Identical Strangers" they were separated at birth by a Mengelesque psychologist for the purpose of a research study on the impact of Nature Vs. Nurture.